Eight months after caring for more than 100 patients during the October 1, 2017 mass shooting in Las Vegas, five members of the Desert Springs Hospital Emergency Department journeyed to the Center for Domestic Preparedness (CDP) in Anniston, AL — the nation’s premier all-hazard training center — for additional disaster education in May. “With our proximity to the Las Vegas Strip, McCarran Airport, and University of Nevada, Las Vegas, we want as many tools and resources at our disposal in case we have another situation where we need to provide quick care to a large number of emergent patients,” said Stacey Helton, RN, Director of Emergency Services at Desert Springs Hospital. Brooke Backer, RN, ER bedside educator; David Barrett, RN, ER Clinical Supervisor; Travis Legrand, RN, ER manager; John Kay, EMT-P; and Joanne McCready, RN, ER traveled to Alabama for the five-day curriculum of courses and hands-on skills training. The team was involved in both mass casualty incidents (MCI) and chemical, biological, radiological, nuclear and explosive (CBRNE) events. Days were long, beginning at 5:30 a.m. for breakfast and classes running from 7:30 a.m. to 6 p.m. Monday through Friday. 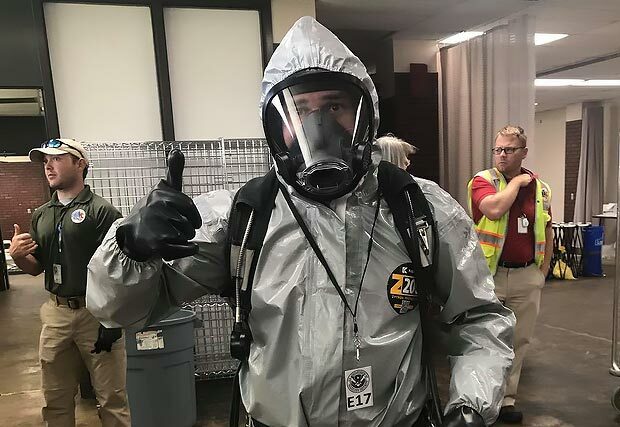 “On the last day, we had a mock CBRNE/MCI event – Hurricane Chuck, which hit land and could potentially affect the chemical plants, rail lines and highways. There was also a fault line, which could lead to earthquake activities. Meanwhile, the hotels were full of evacuees, so we were expected to possibly see and treat a very large number of people,” said Backer. “This event really tied our training together to show what we learned and what to expect during an actual event.